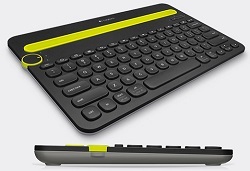 Logitech's Bluetooth Multi-Device Keyboard K480 is the computer keyboard that also works with your tablet and smartphone. You can attach three (3) devices at once to your keyboard and switching between them is easy -- just turn the easy-switch dial! The integrated cradle holds your phone or tablet at just the right angle for you to read while you type. You'll also find a familiar keyboard layout with all the shortcut keys you use the most - including those for Windows, Mac or Chrome computers; or for Android or iOS mobile devices. Shoot and save more high-quality photos and Full HD video on your Android smartphone or tablet. Charge and Sync your Micro USB-equipped Smartphone or Tablet with reduced clutter.